Medial oblique radiographs of both feet in a patient with unilateral calcaneonavicular coalition. A, Unaffected side. B, Fibrous calcaneonavicular coalition (arrows). Note the decrease in the space between the calcaneus and navicular with the formation of pseudoarthrosis. Lateral radiographs of both feet in a patient with unilateral calcaneonavicular coalition (same patient as in previous image). A, Unaffected side. B, Fibrous calcaneonavicular coalition. Note the elongated tubular extension of the anterior calcaneus seen on the lateral film (arrows) compared to the unaffected side. Talocalcaneal coalition. Lateral radiograph of the foot reveals a classic C sign (arrows), which is a C-shaped line formed by the medial outline of the talar dome and the inferior outline of the sustentaculum tali. The C sign is a reliable indicator of subtalar coalition on lateral radiographs. See the radiographic images below. 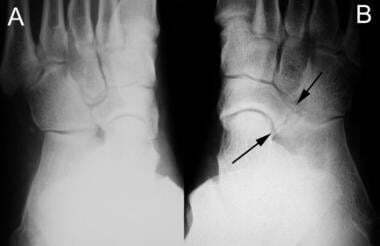 Calcaneonavicular coalition is viewed best on a 45° internal oblique radiograph. Calcaneonavicular coalition is not depicted well on AP and lateral projections. A coalition bridge extends from the anterolateral process of the calcaneus and fuses with the dorsolateral margin of the navicular bone. A solid bony bar forms a bridge if an osseous coalition is present. Occasionally, a fracture can appear through the coalition. In patients with fibrous and cartilaginous coalitions, irregularity and narrowing of bone interfaces may occur in addition to sclerosis and eburnation. 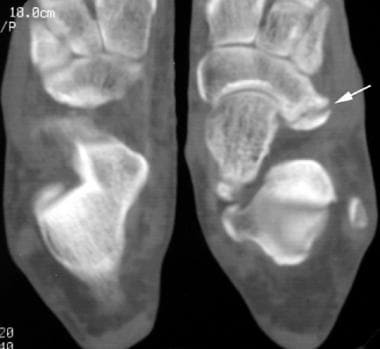 A secondary radiographic sign of hypoplasia of the talar head is observed in some patients. Talocalcaneal coalition often involves the middle facet at the talar-sustentaculum tali junction. The anterior and posterior facets are involved less frequently. Talocalcaneal coalitions are difficult to visualize using the 3 standard radiographic projections. Harris-Beath (axial) views of the hindfoot are useful for visualizing the posterior and middle facets. With the ankle slightly dorsiflexed at 10°, the beam is directed through the hindfoot at a 45° angle. The angle is adjusted if the facets are still not well demonstrated. Obliteration or irregularity of the facets is indicative of a coalition. The talar beak occurs because of limitations of the subtalar joint motion. This rigidity causes the navicular bone to sublux dorsally. At the insertion of the talonavicular ligament, a periosteal reaction occurs, and continued osseous repair leads to the formation of a beak at the dorsal aspect of the talar head. Although it is less common, a similar type of formation can occur at the navicular dorsal surface. A beak is not present in all patients with talocalcaneal coalition. Furthermore, these findings are not necessarily pathognomonic for a coalition. The beak may be seen in other conditions that can limit motion, such as diffuse idiopathic skeletal hyperostosis and rheumatoid arthritis. Typically, the sustentaculum tali slopes upward. In patients with talocalcaneal coalition, an abnormal horizontally positioned sustentaculum tali may be present. This causes an attenuation in the x-ray beam as it crosses the sustentaculum over an increased distance. Unfortunately, false-positive C signs can occur with severe pes valgus deformity and improper positioning. In addition, the C sign may be incomplete or missing. This may be seen with variations in sustentaculum tali size and orientation, radiolucent fibrous or cartilaginous talocalcaneal coalitions, and mild cases of coalition with lack of involvement at the posterior subtalar joint. Concavity of the undersurface of the talar neck is seen occasionally. The ball-and-socket ankle joint refers to an adaptive change caused by subtalar limitations in motion. Biomechanical stressors resulting from restrictions with inversion and eversion cause the proximal talar surface to become convex and cause a concavity to form at the distal tibial surface. The ball-and-socket joint is not pathognomonic for talocalcaneal coalition; this appearance can occur in midfoot disorders, genu valgum deformity, shortened extremities, or hypoplasia or aplasia of the fibula. Flattening and rounding of the lateral talus can occasionally be seen. This finding is most apparent when compared with radiographs of the opposing unaffected foot. Narrowing at the posterior talocalcaneal joint space is noted in approximately 50% of patients. This finding may be the result of calcaneal eversion or degenerative arthritic change. CT data are usually unequivocal for osseous involvement. However, CT has limitations, and MRI is superior in differentiating osseous from fibrous coalitions. False-positive findings can occur with CT because of its limitations in the detection of nonosseous coalitions. See the CT scan images below. CT scan in a patient with unilateral calcaneonavicular coalition. Note pseudoarthrosis between the calcaneus and navicular bones (arrow). Talocalcaneal coalition. CT scan. Note the fusion of the sustentacular articulation with solid bone obliterating the joint. Joint-space narrowing and reactive sclerosis can be seen in calcaneonavicular coalitions. On axial views, 2 abnormalities are noted: Medial broadening of the anterior and dorsal aspects of the calcaneus can occur at the navicular interface. On coronal views, lateral bridging with protrusion of an abnormal bony mass and rounding of the talus may be present. Coronal CT images are the most useful in the assessment of talocalcaneal coalitions. As mentioned previously, the middle facet of the talocalcaneal articulation is most frequently involved. Occasionally, osseous bridging can be seen at the posterior and anterior facets; often, these findings are associated with more progressive cases. Evaluating the sustentaculum tali carefully is important. The sustentaculum often extends in an upward medial direction. It may slant downward or laterally in talocalcaneal coalitions. Hypoplasia of the sustentaculum is noted occasionally; however, broadening of this structure is relatively common. As expected, findings in nonosseous coalitions usually are subtler. Articular narrowing and reactive bony changes, such as subchondral sclerosis and cystic changes, are sometimes minimal. See the magnetic resonance images below. 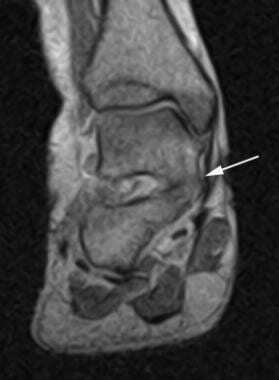 MRI in a patient with calcaneonavicular coalition. 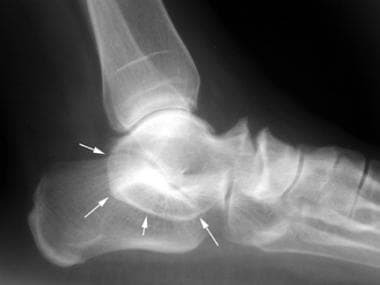 Note pseudoarthrosis between the calcaneus and navicular bones (arrows). Talocalcaneal coalition. MRI shows the fusion of the sustentacular articulation with solid bone obliterating the joint (arrow). Sagittal and axial images are most useful in the evaluation of calcaneonavicular coalitions. Sagittal views are particularly advantageous because of the oblique alignment of a calcaneonavicular bridge. Coronal views are valuable for assessing talocalcaneal coalitions. A continuous bone marrow bridge is visible at the junction of an osseous coalition. Marginal reactive changes can be noted. STIR, fat-saturated T2-weighted, or proton density–weighted imaging may show edema at the articulation. In nonosseous coalitions, findings such as articular narrowing and irregularity of joint space signal intensities may be present. With fibrous and cartilaginous coalitions, a more precise interpretation is obtained with MRI than with other imaging modalities. Blakemore LC, Cooperman DR, Thompson GH. The rigid flatfoot. Tarsal coalitions. Clin Podiatr Med Surg. 2000 Jul. 17(3):531-55. [Medline]. Bohne WH. Tarsal coalition. Curr Opin Pediatr. 2001 Feb. 13(1):29-35. [Medline]. Kumar SJ, Guille JT, Lee MS, Couto JC. Osseous and non-osseous coalition of the middle facet of the talocalcaneal joint. J Bone Joint Surg Am. 1992 Apr. 74(4):529-35. [Medline]. Leonard MA. The inheritance of tarsal coalition and its relationship to spastic flat foot. J Bone Joint Surg Br. 1974 Aug. 56B(3):520-6. [Medline]. Thometz J. Tarsal coalition. Foot Ankle Clin. 2000 Mar. 5(1):103-18, vi. [Medline]. Teramoto A, Kura H, Uchiyama E, Suzuki D, Yamashita T. Three-Dimensional Analysis of Ankle Instability After Tibiofibular Syndesmosis Injuries: A Biomechanical Experimental Study. Am J Sports Med. 2007 Oct 16. [Medline]. Barrett SE, Johnson JE. Progressive bilateral cavovarus deformity: an unusual presentation of calcaneonavicular tarsal coalition. Am J Orthop. 2004 May. 33(5):239-42. [Medline]. Resnick D. Diagnosis of Bone and Joint Disorders. 3rd ed. Philadelphia: WB Saunders Co. 1995:4294-301. 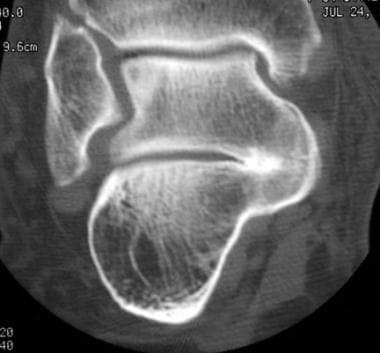 Resnick D. Talar ridges, osteophytes, and beaks: a radiologic commentary. Radiology. 1984 May. 151(2):329-32. [Medline]. Bourdet C, Seringe R, Adamsbaum C, Glorion C, Wicart P. Flatfoot in children and adolescents. Analysis of imaging findings and therapeutic implications. Orthop Traumatol Surg Res. 2013 Feb. 99(1):80-7. [Medline]. Emery KH, Bisset GS 3rd, Johnson ND, Nunan PJ. Tarsal coalition: a blinded comparison of MRI and CT. Pediatr Radiol. 1998 Aug. 28(8):612-6. [Medline]. Hochman M, Reed MH. Features of calcaneonavicular coalition on coronal computed tomography. Skeletal Radiol. 2000 Jul. 29(7):409-12. [Medline]. Newman JS, Newberg AH. Congenital tarsal coalition: multimodality evaluation with emphasis on CT and MR imaging. Radiographics. 2000 Mar-Apr. 20(2):321-32; quiz 526-7, 532. [Medline]. Sakellariou A, Sallomi D, Janzen DL, et al. Talocalcaneal coalition. Diagnosis with the C-sign on lateral radiographs of the ankle. J Bone Joint Surg Br. 2000 May. 82(4):574-8. [Medline]. Iyer RS, Thapa MM. MR imaging of the paediatric foot and ankle. Pediatr Radiol. 2013 Mar. 43 Suppl 1:S107-19. [Medline]. Lawrence DA, Rolen MF, Haims AH, Zayour Z, Moukaddam HA. Tarsal Coalitions: Radiographic, CT, and MR Imaging Findings. HSS J. 2014 Jul. 10 (2):153-66. [Medline]. Umul A. MRI Findings of Talocalcaneal Coalition: Two Case Reports. Acta Inform Med. 2015 Aug. 23 (4):248-9. [Medline]. Crim JR, Kjeldsberg KM. Radiographic diagnosis of tarsal coalition. AJR Am J Roentgenol. 2004 Feb. 182(2):323-8. [Medline]. Oestreich AE, Mize WA, Crawford AH, Morgan RC Jr. 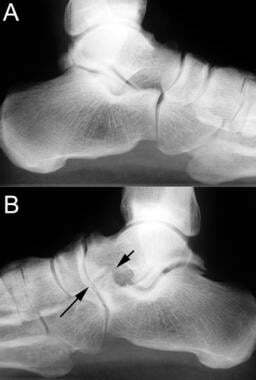 The "anteater nose": a direct sign of calcaneonavicular coalition on the lateral radiograph. J Pediatr Orthop. 1987 Nov-Dec. 7(6):709-11. [Medline]. Brown RR, Rosenberg ZS, Thornhill BA. The C sign: more specific for flatfoot deformity than subtalar coalition. Skeletal Radiol. 2001 Feb. 30(2):84-7. [Medline]. Lateur LM, Van Hoe LR, Van Ghillewe KV, et al. Subtalar coalition: diagnosis with the C sign on lateral radiographs of the ankle. Radiology. 1994 Dec. 193(3):847-51. [Medline]. Taniguchi A, Tanaka Y, Kadono K, Takakura Y, Kurumatani N. C sign for diagnosis of talocalcaneal coalition. Radiology. 2003 Aug. 228(2):501-5. [Medline]. Wechsler RJ, Schweitzer ME, Deely DM, et al. Tarsal coalition: depiction and characterization with CT and MR imaging. Radiology. 1994 Nov. 193(2):447-52. [Medline]. Sijbrandij ES, van Gils AP, de Lange EE, Sijbrandij S. Bone marrow ill-defined hyperintensities with tarsal coalition: MR imaging findings. Eur J Radiol. 2002 Jul. 43(1):61-5. [Medline]. Goldman AB, Pavlov H, Schneider R. Radionuclide bone scanning in subtalar coalitions: differential considerations. AJR Am J Roentgenol. 1982 Mar. 138(3):427-32. [Medline].